Marooned 20,000 years from home, in Paleolithic Eastern Europe, a West Point man is assigned a mission by his adopted tribe for which he has not been trained. He must find and take the Scavenger Folk man that has been lurking near the village. Science Fiction Grand Master, Robert Silverberg, is at the top of his form in this sly & endearing story. Another stunning audio achievement from Infinivox! 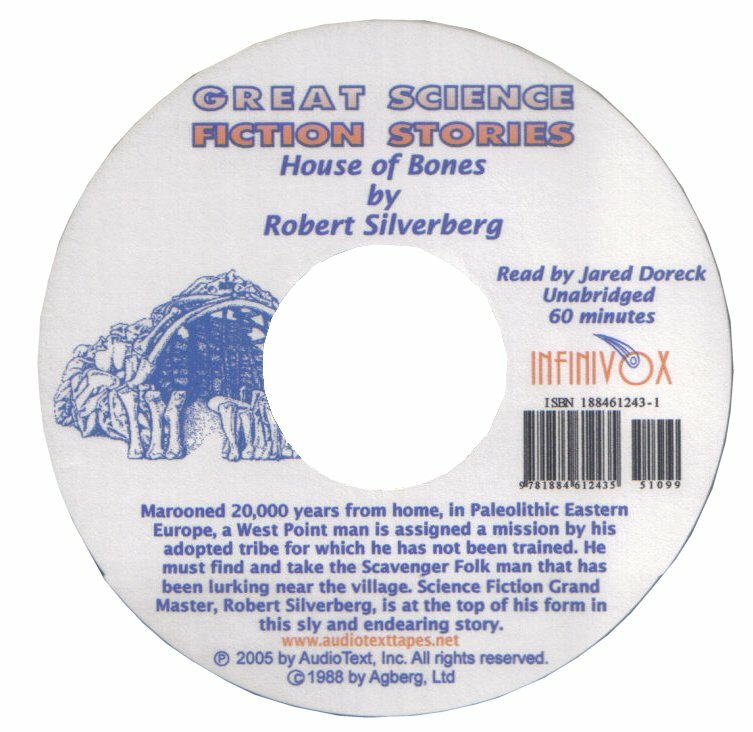 House Of Bones is a unique time-travel story that imbues a deep sense of satisfaction on nearly every level. A top shelf reading by a dynamic reader, a dynamite story and an elegant production combine to make pure aural delight! House Of Bones is a modest tale, recounting the unfortunate fate of the world's first and perhaps last time traveler. After a misguided test run he's become trapped 20,000 years in our past, unequipped for survival his future is uncertain. What's worse he's surrounded by people so primitive they don't even have a written language. So primitive they take in his unworthy and skilless self and accept him into their society. This glimpse of what life might have been like for Cro-Magnon man in the late Pleistocene epoch shows us precisely why we can't judge a society by it's lack of tool based technology. Silverberg skillfully extrapolates a fascinating working culture out of what little modern archaeologists and paleoanthropolgists know of these people, our ancestors and creates in the process something to think about when using words like "primitive". House Of Bones is kind of a mirror image of Isaac Asimov's The Ugly Little Boy. And like that tale this one is a keeper.